The former Thorndike Store, 2016. The Cunninghams' cottage across from the Common near the flag pole is named after Joseph Thorndike, an eminent figure in early days. He was selectman, moderator, representative to the General Court, tax collector, highway surveyor, school agent, and justice of the peace. Later the building was known as the Phelps cottage, and in recent times as the Farnham or Hekking place. The site was originally owned by Capt. Samuel Adams, who built the Meeting House, then owned (1785) by his father Isaac, who did a business in buying and selling lots and holding mortgages on land around the Common. 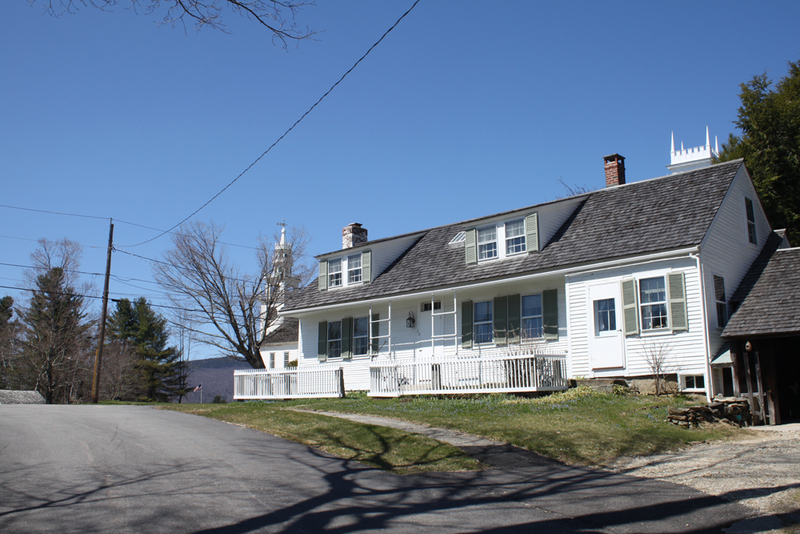 Thorndike bought the property from Isaac Adams in 1792, as a general store for his sons Andrew and Henry. The building may have been begun earlier, as there are date-marks of 1790 on it. Until the middle of the last century the building generally housed a store. Early storekeepers included: Daniel Emory, 1806; Jonathan Wheelock, 1810-1812; Henry Payson, 1815- 1824; Capt. John Wright, 1824-1827. The Town History comments on Capt. John and his brother: "It is presumed that confirmed habits of intoxication barred them from the responsibilities of married life." William Lacy ran the store and post office from 1842 to 1846. Dr. Gurley Phelps, who purchased the cottage from banker Jonas Melville in 1858, had come to Jaffrey in 1849 and married a daughter of Benjamin Cutter. Phelps converted the building to a dwelling house, although he continued to use it as a post office. He was postmaster 1861-88, as well as physician and surgeon, deacon, clerk of the First Church, and a prudent investor in real estate. His son, Charles S. Phelps inherited the cottage in 1902 and occupied it 1910-45. Thereafter it was the property of Mrs. George (Vivian) Farnham 1947-61, Mrs. William (Vivian) Hekking 1965-69. Since 1969 it has been the residence of Professor and Mrs. Richard Cunningham.